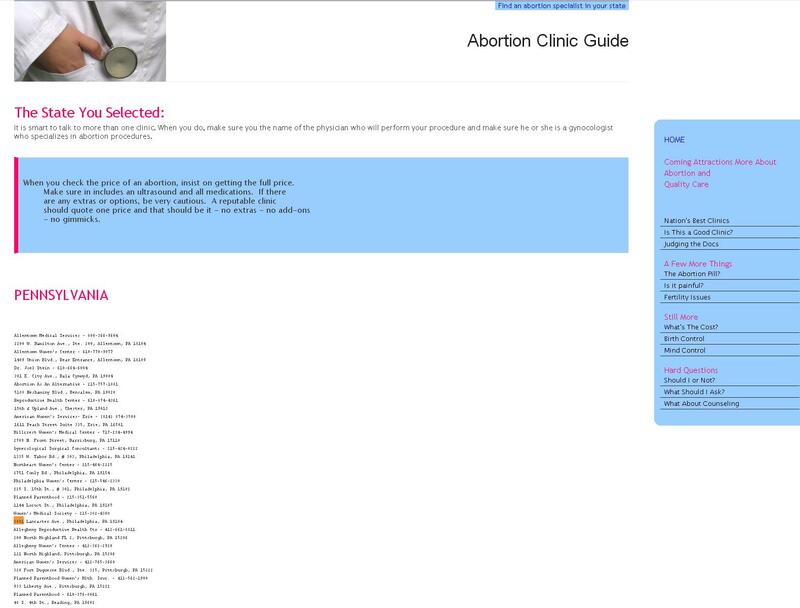 Pro-choicers like to “Claim” they are FOR WOMEN and SAFE ABORTION- yet they advertise the most hideous of abortion clinics on their websites, because in the world of abortion all that matters is that it remains legal. 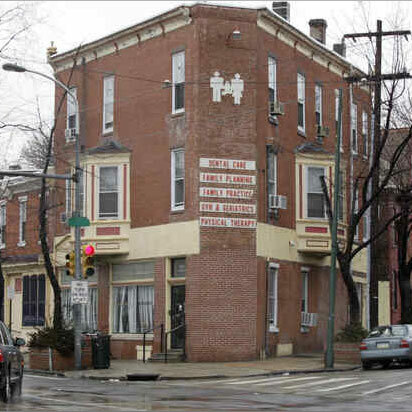 When authorities raided Kermit Gosnell’s ‘House of Horrors’ abortion clinic, called the Women’s Medical Society located at 3801 Lancaster Ave., Philadelphia, PA in February 2010, among the many grisly discoveries were the bodies of some 45 unborn babies. The remains were frozen and stored in a variety of containers, including milk jugs, cat food cans, and even a cherry lime-ade container. 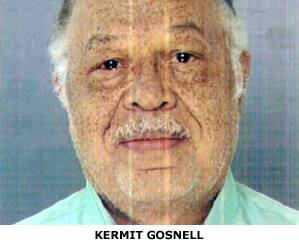 Prosecutors say the pervasive culture of greed and indifference at Kermit Gosnell’s “house of horrors” abortion clinic in Philadelphia is directly responsible for the death of a 41-year-old woman, at least seven babies, and the addiction of an unknown number of Pennsylvanians to illegal prescription drugs. So why are Pro-choice websites STILL advertising this abortion mill? 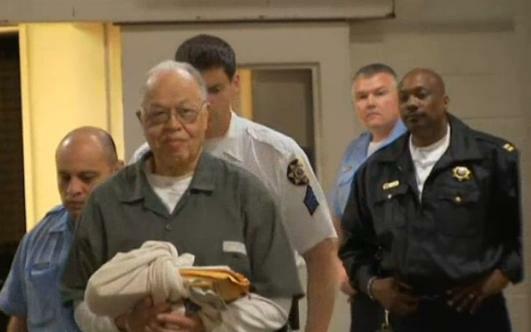 Kermit Gosnell was locked up after prosecutors found him guilty of murdering three babies who were born alive in his Philadelphia clinic. Apparently a few pro-choicers didn’t get the memo- or perhaps – they don;t care about women after all. Fox News Contributor Sally Kohn posted a speech she gave to NARAL, an abortion rights group, on the Daily Beast. In the speech, Kohn completely misleads her audience and rewrites the history of abortionist Kermit Gosnell. Kohn writes, “West Philadelphia is where Kermit Gosnell ran an underground, illegal abortion clinic. Thankfully, Gosnell was exposed because of abortion activists, and Gosnell was tried and convicted of three counts of first-degree murder. He was sentenced to life without parole for each of the three murders. And, as a side note, I feel deeply conflicted about our system of aggressive prosecution and incarceration in America—but I don’t for a second feel conflicted about a Gosnell being locked up forever for his crimes. Kohn’s words are pure unadulterated SPIN at the very best, if not outright lies. First Kohn lies when she claims that Gosnell ran an underground/illegal abortion clinic. Doctors at the University of Pennsylvania Health System, which operates two hospitals within a mile of Gosnell’s squalid abortion clinic in West Philadelphia, saw at least six of these patients — two of whom died. But they largely failed in their legal and ethical duties to report their peer’s incompetence, according to a grand jury report. “We are very troubled that almost all of the doctors who treated these women routinely failed to report a fellow physician who was so obviously endangering his patients,” wrote the Philadelphia grand jurors, who recommended a slew of charges against Gosnell and his staff in January. The health system — in apparent contradiction of the grand jury report — released a statement saying that it had “provided reports to the authorities regarding patients of Dr. Gosnell who sought additional care at our hospitals” starting in 1999. But the system’s attorneys could produce only a single report for the grand jury. That involved 22-year-old Semika Shaw, who died at the university hospital of internal bleeding and sepsis after a botched abortion in 2000. Gosnell’s insurers ultimately paid out a $900,000 settlement in that case. Health system spokeswoman Susan Phillips later clarified the statement, saying “we have staff who specifically recall making oral reports” to state officials about Gosnell. “Unfortunately, we have not been able to find additional written reports from these past years,” she wrote in an email. A Philadelphia doctor and suburban medical examiner who did blow the whistle said they never heard back from state officials, whose repeated lapses helped Gosnell to operate unchecked for years. Latosha Lewis, a Gosnell employee, testified that emergency room staff at the university hospital told her they treated many Gosnell patients, the report said. Gosnell opened his Women’s Medical Society at 38th Street and Lancaster Avenue in 1979. The Department of Health first granted approval for the Women’s Medical Center to provide abortions at 3801 Lancaster Avenue on December 20, 1979. The approval followed an on-site review and was good for 12 months. 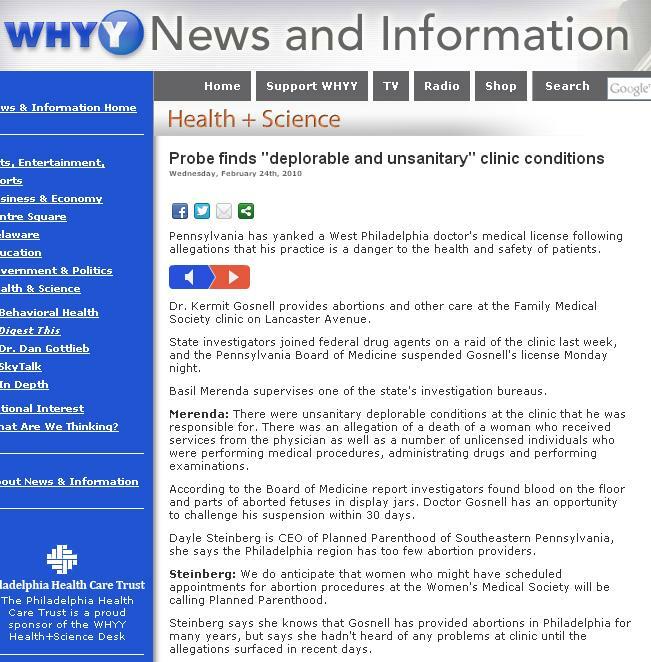 The DOH “site review” at the time identified a certified obstetrician/gynecologist, Joni Magee, as the medical director, with Gosnell listed as a staff physician. The report noted that a registered nurse worked two days a week, four hours a day, and that lab work was sent out to an outside laboratory. FIRST INSPECTION – The Pennsylvania Department of Health had contact with the Women’s Medical Society dating back to 1979, when it first issued approval to open an abortion clinic. 1979- Pennsylvania Department of Health approval to do abortions at his clinic in 1979, after an on-site inspection. The Pennsylvania Department of Health did not conduct another site review until 1989, ten years later. Numerous violations were already apparent, but Gosnell got a pass when he promised to fix them. In 1992, The Pennsylvania Department of Health Site reviews in 1992 and 1993 also noted various violations, but again failed to ensure they were corrected. Sometime after 1993, the department of health instituted a policy of inspecting abortion clinics only when there was a complaint, but the grand jury found that it didn’t even do that. Gosnell has hardly been an underground nor illegal abortion clinic, Gosnell was allowed to stay in business as pro-abortion regulators turned a blind eye. conditions; the unlicensed workers; the unsupervised sedation; the underage abortion patients; even the over-prescribing of pain pills with high resale value on the street. Department assigned an investigator, whose investigation consisted primarily of an offsite interview with Gosnell. The investigator never inspected the facility, questioned other employees, or reviewed any records. Department attorneys chose to accept this incomplete investigation, and dismissed the complaint as unconfirmed. 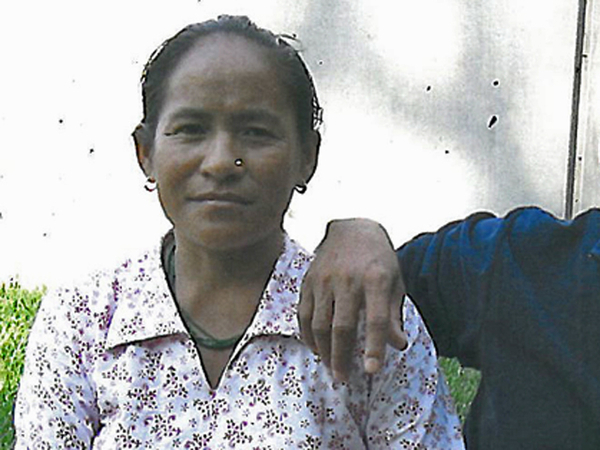 Shortly thereafter the department received an even more disturbing report – about a woman, years before Karnamaya Mongar, who died of sepsis after Gosnell perforated her uterus. The woman was 22 years old. A civil suit against Gosnell was settled for almost a million dollars, and the insurance company forwarded the information to the department. That report should have been all the confirmation needed for the complaint from the former employee that was already in the department’s possession. Instead, the department attorneys dismissed this complaint too. They concluded that death was just an “inherent” risk, not something that should jeopardize a doctor’s medical license. Then, in In January 2002, an attorney representing Semika Shaw, a 22-year-old woman who had died following an abortion at Gosnell’s clinic, wrote to authorties requesting copies of inspection reports for any on-site inspections of the clinic conducted by DOH. Staloski wrote to the attorney that no inspections had been conducted since 1993 because DOH had received no complaints about the clinic in that time.…In other words, Gosnell was fully licensed yet UNREGULATED ! at Gosnell’s clinic. Davis requested that a site visit be conducted to assure that proper infectiouswaste handling and disposal practices were in place. Davis further instructed Gruen: “I am not expecting a ‘wild goose chase’ for aborted fetuses.” Current Philadelphia Health Commissioner Donald Schwarz testified that notations on the memo seem to indicate that a site visit was, in fact, made. The city health department, however, could not produce any report of that site visit. Nor is there evidence that the department took any action against Gosnell for his dangerous handling of medical waste, or for his failure to have an approved infectious waste plan, as is required by the city Health Code. On May 7, 2004, a city health department inspector was sent to the clinic. 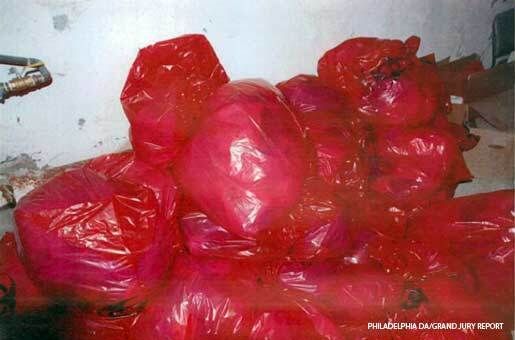 His report stated that proper labels were missing from areas where waste was stored; that red bag containers for infectious waste were not lidded; that marked boxes of infectious waste were sitting on the basement floor – not raised as they should be; that red bags for pick-up were not properly stored in the basement; and that the clinic did not provide a contract with a disposal company. Gosnell subsequently produced some more paperwork, including a copy of a contract for disposal. However, he never paid his fee. The city never approved his medical waste plan. And he never cleaned up the infectious waste. Yet five years later, he was still operating. In 2008, a City of Philadelphia employee, a registered nurse named Lori Matijkiw, did notice and report the abysmal conditions she observed at Gosnell’s clinic. Matijkiw conducted what the Health Department calls an “AFIX” visit, or vaccine inspection, in July 2008. On July 16, 2008, at 1:30 p.m., Matijkiw made a vaccine inspection visit to Gosnell’s clinic. Unlike the inspectors before her, she did not simply stick to her narrow, assigned task of inspecting vaccines and their storage units. She took seriously her broader duty to protect public health. Following her visit to Gosnell’s facility, she reported on a multitude of deficiencies she found. She noted that the office was “not clean at all, and many areas of the office smell like urine.” She reported a “dark layer of dust” on the baseboards and described the “enormous” fish tanks, filled with murky water. In the refrigerator, she found expired vaccines – one with an expiration date of March 2006, another 2005. The temperature log, which was supposed to record the refrigerator temperature every day, had not been marked since the second day of June – a month and a half earlier. On top of the refrigerator, she found a stack of temperature logs, already filled out, showing readings twice a day, with no initials, time, or month. According to the Grand Jury Report, report, Gosnell, in addition to operating his own clinic in Pennsylvania, worked one day a week at Atlantic Women’s Medical Services in Wilmington, Delaware. 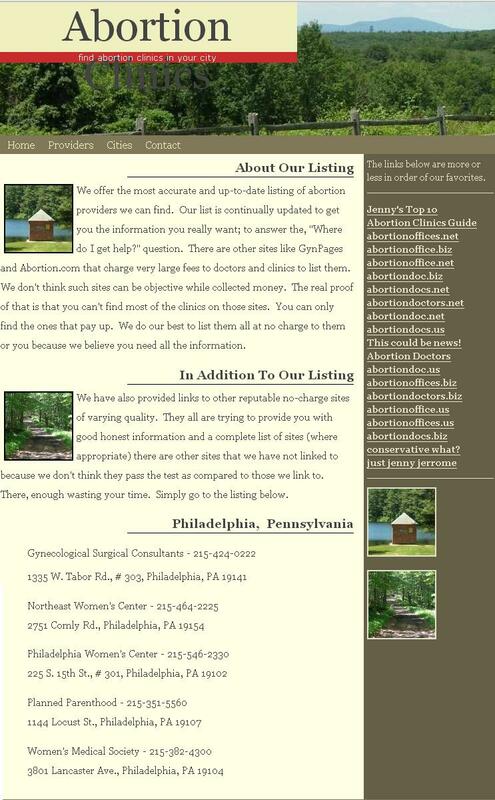 Atlantic was a NAF accredited abortion clinic, so Gosnell was hardly UNDERGROUND like Kohn, suggested. The grand jury report found that he routinely referred women who were too far along in their pregnancy to get an abortion under Delaware law to his West Philadelphia clinic. Finally, in 2010, Federal drug agents raided Gosnell’s abortion clinic. And it was that raid, which triggered another inspection by health investigators four days later. 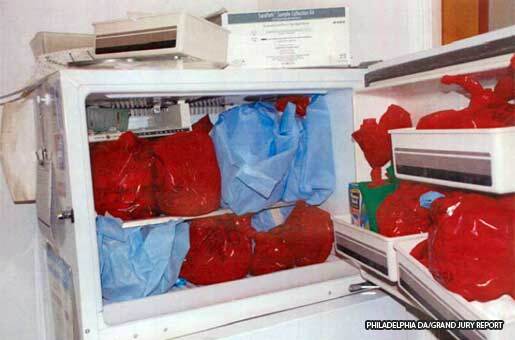 They found Gosnell’s abortion clinic was filthy, with fetal remains filling a freezer and clogging drains. He allowed unlicensed employees to give anesthesia, often leaving patients unattended, the report said. March 12, 2010 the state Department of Health filed papers to begin the process of shutting down the clinic. No where in the Grand Jury Report, nor Court Documents does it indicate that “Reproductive Rights” activists, as Kohn wrongly asserts ever reported ANYTHING to authorities to force the closure of Gosnell’s abortion clinic. In fact, there appears to be evidence that in addition to NAF knowing the clinic’s conditions, Planned Parenthood did as well. Kohn is wrong again when she claims there were repeated exposure by reproductive justice activists and feminist journalists who exposed Gosnell. Steinberg: We do anticipate that women who might have scheduled appointments for abortion procedures at the Women’s Medical Society will be calling Planned Parenthood. 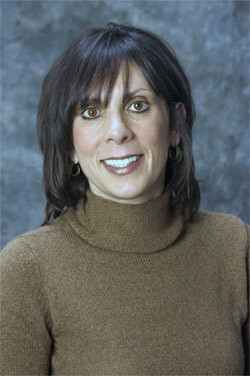 Dayle Steinberg is CEO of Planned Parenthood of Southeastern Pennsylvania. Steinberg began her association with Planned Parenthood Southeastern Pennsylvania (PPSP) in 1978 as a graduate intern, joined the full-time staff in 1981, served as director of surgical services from 1986-1992, then served for eight years as senior vice president, and was appointed president and CEO in 2001. 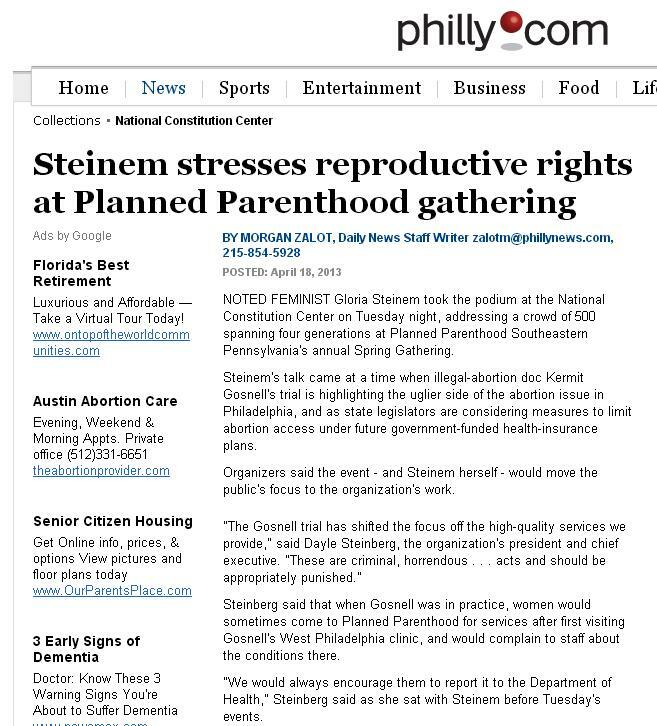 “Steinberg said that when Gosnell was in practice, women would sometimes come to Planned Parenthood for services after first visiting Gosnell’s West Philadelphia clinic, and would complain to staff about the conditions there. 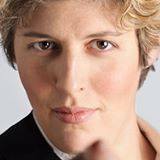 Next time NAF, NARAL or Planned Parenthood send their spinners like fake “journalist” Sally Kohn to say that Gosnell ran an illegal abortion clinic and it was the abortion rights promoters who screamed for him to be shut down- tell them they are LIARS – because the FACT do not add up to their abortion spin !!! Lest you think that Sally Kohn’s attempt is the first and only attempt at spinning horrific legal abortion clinic conditions read Pro-choice Wall of Silence or complicity in the War on Women – when abortion injures and kills the women they claim to protect. LAUREL — While most Americans will celebrate freedom this Independence Day, Jones County Assistant District Attorney J. Ronald Parrish’s celebration will include a lot more. Parrish will celebrate the fact that a local physician who was found guilty of manslaughter in January 2008 for the shooting death of his wife failed in an attempt to win his freedom. 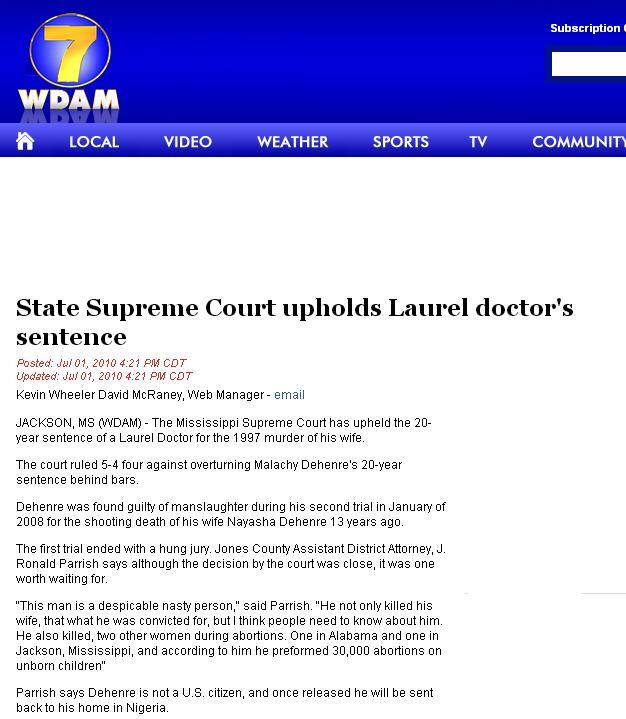 In a 5-4 vote Thursday, the Mississippi Supreme Court upheld the 20-year sentence of Dr. Malachy DeHenre. The physician, a Nigeria native, was found guilty of manslaughter during his second trial for the shooting death of his wife, Nayasha, at the couple’s Laurel residence on Jan. 23, 1997. DeHenre’s first trial ended in a mistrial, with an 11-1 vote by the jury for acquittal. “I learned that at 1:30 p.m. today, the Mississippi Supreme Court, confirmed the conviction of Dr. Malachy DeHenre in the killing of his wife,” said Parrish. “No case I’ve handled since I’ve been here gives me as much gratification as this one. According to a Dec. 15, 2006 LL-C article, DeHenre had his license to practice medicine in Alabama suspended for malpractice after an Alabama woman died as a result of an abortion DeHenre performed on her there in 2003. Also, DeHenre’s New Woman Medical Center, an abortion facility in Jackson, was closed in 2005. In December 2005, Hinds County Circuit Judge Winston Kidd required DeHenre to pay $500,000 in damages to a woman who was injured in a failed abortion. And in March 2005, the Mississippi state medical board suspended his medical license over botched abortions. “On my way home one day, I stopped and picked up a newspaper,” said Parrish. “That’s something I usually don’t do, but it was different this day. “There was (DeHenre’s) big smiling face and a story that said he was getting his medical license back. I wondered why this guy was running around here free, especially after the horrific way he killed his wife who I have heard nothing but praises about. “The day I saw and read that article was a bad day for him,” added Parrish. Parrish said he came back to work the next day and obtained the files for the case. He looked at all of his options and discovered that he could re-open the case. He searched the files night and day and as the old adage goes, the rest is history. In his appeal, DeHenre said his 2008 trial should have been halted after a prospective juror called him an abortionist. He argued that a mistrial should have been declared during jury selection because of the abortionist remark. According to court records, the unidentified prospective juror told the court “every man is entitled to a fair trial, but when DeHenre left here he became an abortionist.” The juror was dismissed from the courtroom. Although DeHenre’s attorneys asked for a mistrial, Jones County Circuit Judge Billy Joe Landrum refused the request after getting an agreement from other jurors that they would not be biased against DeHenre because of the juror’s statement. Following the guilty verdict, DeHenre’s attorneys decided to appeal the conviction. In its decision to reject DeHenre’s appeal, the Court stated that “a trial court may declare a mistrial for misconduct that substantially and irreparably prejudices a party’s case…in this case, a prospective juror referred to the defendant, Dr. Malachy DeHenre, as an abortionist. We must decide whether this isolated statement required a mistrial. We find it did not. “Any harm caused by the statement was reparable, and the trial court took immediate action to cure any potential prejudice,” the Court concluded. Although not all justices did not vote to uphold the conviction, Parrish said he is simply delighted that the majority ruled in his favor. “I feel a whole lot better now knowing that he will remain behind bars, hopefully for the entire 20 years,” said Parrish. “But if he doesn’t stay behind bars the whole time, I have consolation in knowing that when he gets out he will be handcuffed and shipped back to Africa where he came from. “This man was in the country illegally,” he said. “I’m just so proud of the five justices who stood up to the plate and did what was right. “It’s a happy Fourth of July!” said Parrish.